Three members of a southwest Kansas militia dubbed the "Crusaders” were arrested Friday on charges stemming from a plot to attack a housing complex that houses a mosque in Garden City, Kan. Editors' Note: This post has been updated. Curtis Allen, 49, Gavin Wright, 49, of Liberal, Kan., and Patrick Stein, 47, a resident of a nearby Dodge City, Kan., had stockpiled firearms and explosives. They planned to use four explosive-laden vehicles parked at the corners of the complex, which is home to a number of Somali immigrants, officials said during a news conference. The group, which called itself the “Crusaders” had prepared a manifesto in which they said they hoped their attack, scheduled for the day after the General Election, would “wake people up,” Tom Beall, acting U.S. Attorney for the District of Kansas, said. A confidential source attended meetings of the group and provided the FBI with information about the defendants’ activities. The criminal complaint alleges that the men conducted surveillance to identify potential targets, stockpiled firearms, ammunition and explosive components, and planned to issue a manifesto in conjunction with the planned bombing. Hill, who also serves as the Georgia chapter head, told Hatewatch that his group is “associated” with one KSF group, but that there are multiple. Hill stated that the group he is associated with is run by Ronald Greek, but Hill claimed he only talks to Greek “one time a year.” Hill went on to say that he was not familiar with any of the three men arrested in Kansas today. Greek is a member of a closed Facebook group named, “III% Security Force of Kansas.” Another member of the 46-person group is Patrick Stein, one of the three men arrested on Friday. Another closed Facebook group with the name “Kansas State Guard/Kansas Security Force” has two members one of whom is Curtis Allen, another of the men arrested today. 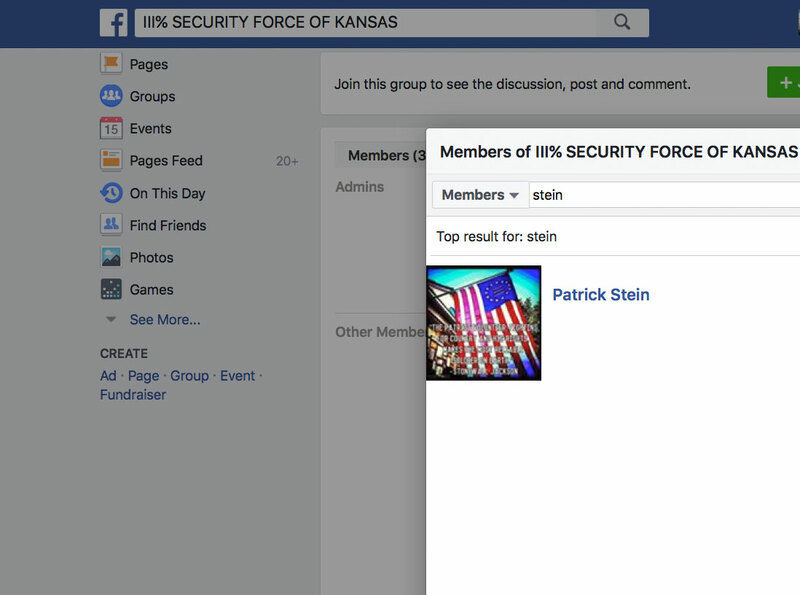 Patrick Stein was a member of a Facebook group called "III% SECURITY FORCE OF KANSAS"
Allen, Wright and Stein appear to have targeted the apartment complex because it was home to a number of Somali immigrants. The targeting of refugees and those institutions helping to settle refugees has been on the rise in recent years. Stein, in particularly, left a hate-filled footprint on social media, where he frequently posted about Muslims. The arrests cap an eight-month investigation led by the FBI involving several confidential informants. On Oct. 12, according to a Justice Department news release, Stein met with one of those informants in rural Finney County, Kansas. There, they test fired automatic weapons before visiting the apartment building, where Stein told the FBI source he would provide money for the attack ammonium nitrate for the bomb –– the same component Timothy McVeigh used in the 1995 to bomb the Alfred P. Murrah building in Oklahoma City. Stein also seemed to have been particularly motivated by the death of Robert “LaVoy” Finicum, the spokesman for the antigovernment occupation of the Malheur National Wildlife Refuge earlier this year. Police shot and killed Finicum as he reached for a pocket containing a handgun after trying to speed past a police road block in January. Since his death, Finicum has become a martyr to the nationwide antigovernment movement.